A very nice item at a great price. Thanks!!!! Great E Bayer just very unusual slow mail delivery. Deceptive listing. HDMI cable pictured but not included. Not worth returning. The first of these switches I bought failed in nine months. Oh well ! The item was defective and Seller refuse to send a return label or refund money. 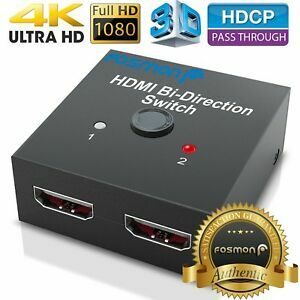 HDMI 2 way switch works ! HDMI 2 way switch works well, taking a signal from a cable box and directing to either of 2 output devices (TV's etc.) The only issue I have is that both of the HDMI output ports apparently need to sense power connectivity in order for the whole box to work (green LED lights), else it shuts down completely. I was hoping to leave power shut off on my second device, to only power up when I wanted to use it. If the HDMI cable to this second device senses no power, all shuts down. The only solution is to pull the HDMI cable out of the second device when not using OR leave the second device powered up all the time so the cable senses it. (I was hoping to switch off main power to the AC adapter for this second device when not using, which is the majority of the time). I got this after the disappointment in another 4K switch. This one is promising - at least the box feels with some weight - not empty hallow like the previous failure. I'm about to hook up to my Apple 4K TV because of my old Bose doesn't support 4K and we got the new 4K TV - I'll need to have ability to choose to project my 4K directly to the TV or to send my HDMI signal to Bose when I only want to listen to music. So I can turn off my LG 4K TV which eat up about 50W of electricity even with screen off. 2 problems arose. The switch will make Apple TV stunned and go blank. You have to unplug either HDMI cable and replug it in again. Furthermore, for 4K output that seems like to work well. It's not, after watching a 4K movie - the signal drop and blink like every 5 mins or so. So, I detached this switch because it's now useless. Back to pulling out HDMI cable and plug it in again. No help here. This little box is great. It feels more heavy duty then other products because it’s actually made of metal instead of plastic. My image quality is crystal clear when using this switch. I haven’t had any issues with it so far. (Though it’s only been a couple days) but it’s very simple to use, just press the button and just like that it switches from one to the other. Very happy and would highly recommend this product. I'm using this as a 1 into 2 switch. I'm single and never have need to have more than one tv on at a time. My master bedroom is right off the living room. Rather than lease a second cable box, I use this to switch from my living room to bedroom televisions. Works great and just what I wanted!